The majority of log splitters are horizontal. You lay your log atop the splitter, and the ram pushes it against a stationary wedge to split it. However, if you're splitting any giant-sized logs, you'll probably have a hard time lifting them onto the log splitter. For those monstrous logs, there are vertical horizontal log splitters. Vertical horizontal log splitters can be pivoted into a vertical position that allows you to roll the log and position it in place without lifting it. If you're only splitting smaller logs, then a horizontal splitter will serve your needs just fine. 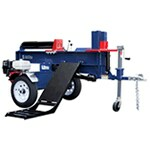 If you can place your logs on a cart or a tailgate, you can place each piece on the splitter without bending. Once split, you can toss the pieces onto a cart. For added convenience, you can opt for a dual-action log splitter, allowing you to split in both directions. This will allow you to continuously keep splitting without waiting for the ram to return to its starting position. The disadvantage of a horizontal model is that you can't roll a massive round of wood onto it. 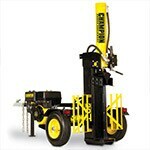 However, you can opt for a horizontal log splitter with a hydraulic lift. Hydraulic log lifts take the strain out of your back without having to change your wood splitter's orientation. The biggest advantage of being able to use a log splitter in the vertical position is that you can split massive logs without lifting them onto the splitter. 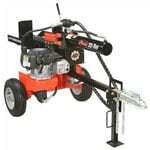 If the majority of what you split is too large to lift, a vertical horizontal log splitter is what you need. The splitting wedge is built onto the ram itself, and the base is flat so you can roll your log on without lifting. With vertical/horizontal wood splitters, you can lower the splitter end to the ground and roll on a large round. When you're finished splitting the larger round, you can raise the splitter back to a horizontal position for splitting the chunks into smaller pieces. You can tow it around your property and split smaller logs into firewood, and when you come across logs too large to lift, you can pivot it into a vertical position to prevent a hernia. So depending whether you split primarily smaller logs, primarily larger logs, or a mix of each, you know which style of splitter will best suit your needs. Horizontal vs. Vertical Horizontal Log Splitters - View Our The Benefits of a Vertical Horizontal Log Splitter. Our log splitter how-to library can help you pick the perfect electric log splitter, gas log splitter, 3-point hitch log splitter, skid steer log splitter or log splitter accessory.